It could be argued that without the Cold War and the NATO alliance European integration would never have been possible. This argument is based on the (largely realist) premise that European integration was dependent on the Marshal Fund and the NATO security guarantee for its success and that neither of these two would have existed (or would have existed to such an extent) had the Cold War not begun. The Marshall Fund, as you have seen, provided aid that helped rebuild the war-ravaged societies and economies of Europe. However, many would suggest that the Marshall plan was based more on dissuading European populations away from communism than on American altruism and that had the Soviet threat not existed, the Marshall plan may not have done either. 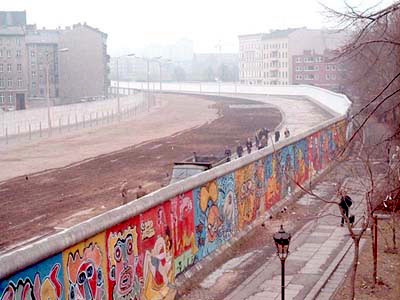 Berlin wall (1961-1989) was an iconic symbol of the Cold War. Likewise, the NATO alliance is often seen as a key factor that facilitated European integration. It is argued that without the security guarantee provided by NATO, the European states would have been forced to spend more money on defence to protect themselves from each other and from the Soviet Union. In turn, European integration would have been much less likely and materially more difficult. Of course, some (of a less realist persuasion) would refute this line of argument and say that European states and peoples were ready for peace at the end of the Second World War and that this drive for peace would have been enough to spur European integration regardless of US intervention in the form of the Marshall Fund or NATO.